In the 1940s, Dr. Florence Sabin spent her retirement from historic scientific discovery at Johns Hopkins University developing a statewide public health system in Colorado. After her groundbreaking career and at the age of nearly 70, Dr. Sabin traveled the entire state to perform the first statewide public health assessment. In 2008, with inspiration from Dr. Sabin, Colorado public health professionals came together to modernize Colorado’s Public Health laws and catalyze change in the public health system to ensure its success into the future. 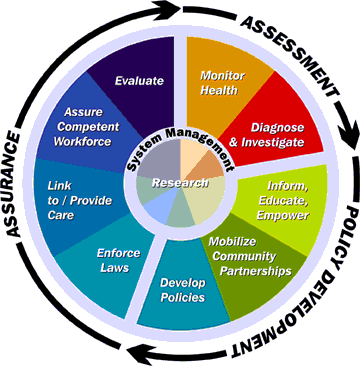 The Public Health Act of 2008 restructured Colorado local public health and set the stage for required statewide assessment and planning as well as the provision of a set of core public health services and standards. Since then, local public health agencies (LPHAs) have been hard at work aligning their services with community needs and state and national standards in order to better serve their communities. Central to these efforts are each agency’s community health assessments (CHAs) and community health improvement plans (CHIPs). Updated every five years, these foundational documents inform the planning, implementation, and evaluation of each agency’s core services. Improving processes, structure, technology, and workforce are vital to this modernization effort, but it is not the only way Colorado’s LPHAs are adapting. With support from CALPHO and other state-level public health organizations, they are taking the long view on public health system transformation. As their communities change demographically and new public health challenges arise, local public health is looking beyond the provision of basic traditional services to ways of addressing prevention more strategically and holistically. The guiding conceptual framework for this approach is the Community Health Strategist model, which outlines how “high-achieving” LPHAs might adapt to these changing conditions by 2020.